More teens and young adults are turning to "bath salts" and "incense", synthetic drugs, to get a high. Incense, also called K2 or spice, mimics the effects of marijuana. Bath salts, dubbed "fake cocaine," are said to be as powerful as abusing methamphetamine or cocaine. More young adults are turning to the drugs because they are easy to get. "Bath Salts" consists of three major chemicals, mephaedrone, methedrone and mdpv-chemicals drug makers use to give people a fake high similar to crystal meth or cocaine. The problem with the synthetic drug is the side effects that are similar to cocaine high, which causes hallucinations, paranoia and anxiety. The same goes for" K2" spice, a synthetic form of marijuana that carries a compound in it to resemble the chemical in "real" marijuana called cannabinoid. "Cannabinoids are typically what's found in plant material marijuana, but these synthetic mimics of that compound hit the same receptors in the body," said Bell. "But we're seeing very different responses than you see from marijuana." Unlike the relaxed feeling from a marijuana high, people who use K2 may have thoughts of suicide or even can overdose. Synthetic cannabis is a psychoactive herbal and chemical product that, when consumed, mimics the effects of cannabis. It is best known by the brand names K2 and Spice, both of which have largely become genericized trademarks used to refer to any synthetic cannabis product. (It is also for this reason that synthetic cannabis is often referred to as spice product, due to the latter.) 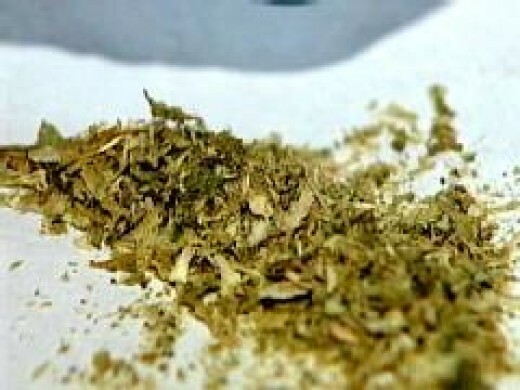 A type of synthetic cannabis sold in Australasia is known as Kronic. A synthetic, stimulant powder product that contains amphetamine-like chemicals, including mephedrone, which may have a high risk for overdose. Because the drug is new and some of the contents unknown, using it in any way is highly dangerous. Right now, bath salts are illegal in a growing number of U.S. states, as well as foreign countries like Canada, Australia and Great Britain. Between January and February 2011, there were over 250 calls to U.S. poison centers related to bath salts. This is well over the 236 calls received for all of 2010. Bath salts are a dangerous drug whose full risks and effects are still unknown. What doctors at poison centers have reported is that bath salts can cause rapid heartbeat, high blood pressure, chest pains, agitation, hallucinations, extreme paranoia and delusions. Bath salts are a relatively new drug, so it's hard to know the full long-term effects, but they seem to have many similarities to methamphetamine (meth). Taking a lot of it for a long time can lead to emotional and physical "crash-like" feelings of depression, anxiety and intense cravings for more of the drug. Since it contains amphetamine-like chemicals, bath salts will always carry the risk of stroke, heart attack and sudden death. It may be legal in some states, but so is rat poison, and you probably wouldn't want to ingest that either. K2 is labeled as an herbal blend, marketed for home incense, but it is being used for much different purposes and could have potentially dangerous effects. • Although K2 is sometimes marketed as synthetic marijuana, the effects can be 10 times more intense than those from marijuana. The dried herbs come in 3-gram packages of various flavors, including "Blonde," "Pink," "Citron" and "Summit." 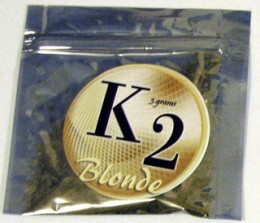 K2 is a smokable blend of common legal herbs that has one of three THC like affecting chemicals added to it. What's this mean? Think of it this way, the grass that grows in your yard if smoked will be harmless, think of this as the legal blend of herbs contained in K2. Now think of Cocaine (Using this as an example because the chemicals contained in K2 come in a white (sometimes yellowish) powder) mixed on top of this legal blend of herbs. The grass in this mixture is not what will affect you if consumed or smoked. The chemical present in K2 acts as a Cannabinoid, compounds that are present in Cannabis, and occur naturally in the nervous and immune systems of animals. What are the names of the Chemicals in K2? What are their Effects & Strengths? To be considered real K2, the blend must contain "One" of the following chemicals. Put simply K2 will only have one of the following chemicals. The following will be listed in the most commonly found chemical in K2. Designed by Dr. John W. Huffman Research Professor at Clemson University. (Read more on Dr. Huffman below, what he is working on is IMPORTANT and over looked) JWH-073 is an analgesic chemical from the naphthoylindole family. This chemical was created to recreate the effects of Cannabis (Cannabis sativa L) at both the CB1 and CB2 receptors. It is somewhat selective for the CB2 subtype, with affinity at this subtype approximately 5x the affinity at CB1. Effects of this chemical when smokes is lethargy. The chemicals effects last much longer when consumed orally than when smoked.Much less research of this compound is much less than the following, so as of this time there is no beneficial properties of this chemical. JWH-073 is legal and unregulated in many parts of the world, including the U.S.A. Designed by Dr. John W. Huffman Research Professor at Clemson University. (Read more on Dr. Huffman below, what he is working on is IMPORTANT and over looked) It should be understood that this chemical has had much more focus study than the previously mentioned drug. JWH-018 is legal in many more countries around the world than JWH-073, because of the promising results found. JWH-018 is so common that it can be found in spice blends and incense very easily. This chemical was created to recreate the effects of Cannabis (Cannabis sativa L) at both the CB1 and CB2 receptors. In has less selectivity for CB2 than the previously mentioned chemical but still shows signs of selectivity at this receptor. The effects of JWH-018 produces a very similar effect to THC, but with a much longer duration of naturally occurring THC and JWH-073. When orally ingested the effects last longer than when smoked. Its effects are by persons considered as very similar to those of cannabis, but more of a general body high with unusually clear cerebral effects. Side effects reported by users is similar to cannabis, such as tachycardia, nausea, paranoia, hallucinations and anxiety. In high doses JWH-018 can also produce a very strong and efficient painkiller. The usual dosage for individual consumption orally varies typically from 3 and 20 milligrams. When smoked the amount to obtain the same effect may be lower, but effects have a lesser duration. 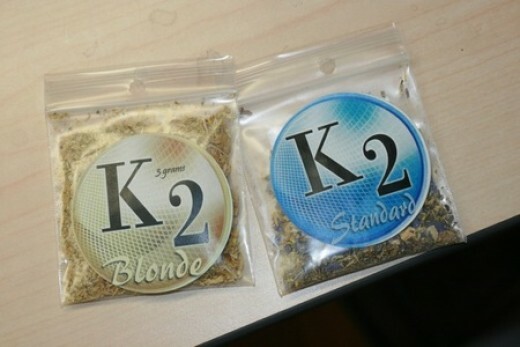 Because K2 is smoked it is assumed that the amount in the blend is generally low, but exact numbers can't be obtained. JWH-018 has been implicated in preventing Alzheimer's Disease and Cancer. HU-210 is 1 to 80,000 times more potent than natural THC that occurs in Cannabis. This chemical is the hardest to find but the most potent. This chemical however, has the most wide-reaching beneficial effects. Per a 2005 article in the Journal of Clinical Investigation, HU-210 promotes proliferation, but not differentiation, of cultured embryonic hippocampal NS/PCs likely via a sequential activation of CB1 receptors. It was also indicated by this increased neural growth to entail anti-anxiety and antidepressant effects. Thinking of how much pharmaceutical company's push Anti-Depressants and Anti-Anxiety medications, with bad side effects almost always out weighing the plus side this alone makes this chemical promising. HU-210, alongside other 'synthetic Cannabinoids' have implicated in preventing the inflammation caused by Amyloid beta proteins involved in Alzheimer's Disease, in addition to preventing cognitive impairment and loss of neuronal markers.